As the housing market came to a crash in 2008, AIG was asked to make good on the products they had been selling as protection against collateralized debt obligations, that they know at the time, would not hold water, and so did the investment banks who were purchasing them. In August of 2010, The Nation ran a story detailing Elizabeth Warren's "devastating report" that helped shed light on the Federal Reserve's decision to use taxpayer dollars to bailout the the financial giant. 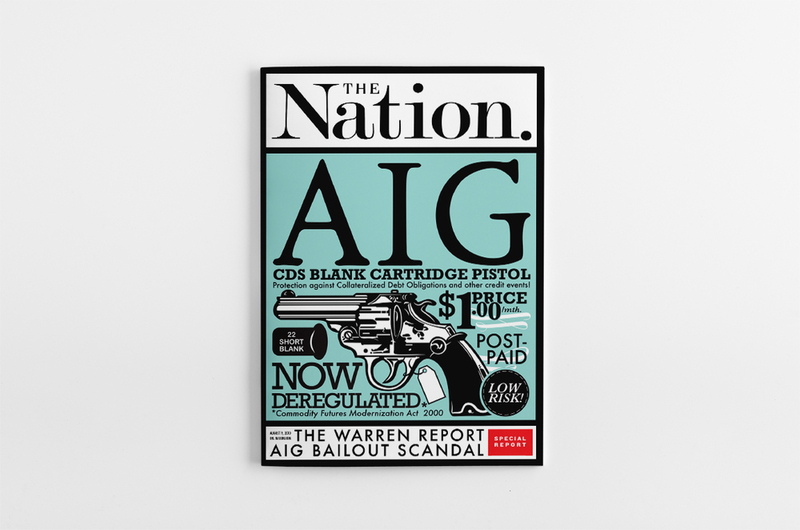 In this illustration, the combination of typography, and visual symbolism come together to suggest that the protection AIG was offering its clientele was as useful as a blank cartridge pistol.